Halloween may not technically be until next week, but some construction workers renovating an old building in Georgia received a proper fright a bit early this year... when they broke open a wall and about 1,000 human teeth came tumbling out. While doing demolition work on the second floor of the T.B. 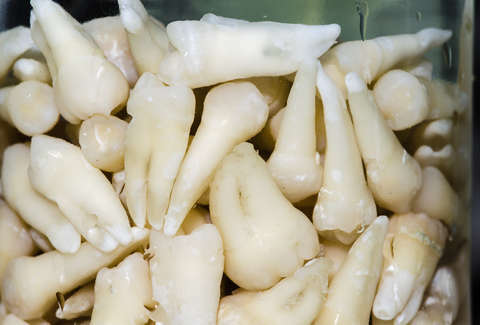 Converse Building in Valdosta, Georgia, a team of workers bust open a wall only to have literally thousands of human teeth fall out at their feet, according to the Valdosta Daily Times. The creepy scene, which sounds like it could have been dreamed up by some hack horror film screenwriter, isn't necessarily cause for concern though. It turns out the building was once home to a dentist's office in the early 1900s, which while not an outright explanation, should assuage any fears that there is a serial killer on the loose stockpiling teeth inside architecture. You're probably wondering why the hell a dentist would stash people's extracted teeth in their wall, and that is a very fair question. It's not entirely clear at the moment, but this isn't actually the first time piles of human teeth have been found in the walls of former dental offices in the area. Similar vaguely morbid depositories have been found in the walls of buildings where dentists worked in the nearby towns of Greensboro and Carrolton, Georgia, per the Daily Times. So, did Southern dentists believe teeth made for good insulation, or what's the deal? “I’m not sure if it was a common practice between dentists at that time, but it’s very strange that there were two other people that said, ‘Hey, we’ve had that happen, too,’” said Ellen Hill, director of Valdosta Main Street, in an interview with the Daily Times. Some, like Gizmodo writer Adam Clark Estes, speculate that back when these old dental practices were operating, there was no proper way to dispose of medical waste like extracted teeth, so putting them in the wall may have seemed like the safest way to keep bacteria-ridden choppers from healthy patients. Then again, there had to have been easier way, right? These days, dentists are required to either properly disinfect extracted teeth and give them back to the patient, or dispose of them in special medical waste containers. There are no plans to further investigate the matter, according to the Daily Times, so we may never really know the reason for this bizarre teeth-stashing practice. Though, for the record, the construction crew has already disposed of the pile (and not just in another wall).